Saladin Ahmed was born in Detroit and raised in a working-class, Arab American enclave in Dearborn, MI. His short stories have been nominated for the Nebula and Campbell awards, and have appeared in Year's Best Fantasy and numerous other magazines, anthologies, and podcasrs, as well as being translated into five foreign languages. 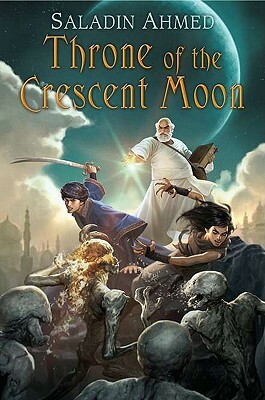 THRONE OF THE CRESCENT MOON is his first novel. Saladin lives near Detroit with his wife and twin children. He can be found at saladinahmed.com. "Readers yearning for the adventures of Fafhrd and the Gray Mouser will delight in the arrival of Adoulla and Raseed. In addition to these two marvelous characters, Saladin Ahmed has given us the wonderful, colorful city of Dhamsawaat, ghuls and demons and manjackals, and the ferocious tribeswoman Zamia, who gives new meaning to the words 'wild girl.'" "Throne of the Crescent Moon is colorful, magical, exciting, and moving. Saladin Ahmed delivers a beautiful story of a demon hunter in an Arabian Nights setting. An excellent first novel!" "This promising debut offers a glimpse of a dusty and wonderful fantasy city through the eyes of three engaging, unconventional protagonists." "Ahmed is a master storyteller in the grand epic tradition. Swashbuckling adventure, awesome mystery, a bit of horror, and all of it written beautifully. A real treat!" "A genuinely brisk, bold, and colorful diversion.... Flashing swords, leaping bandits, holy magic, bloodthirsty monsters, and sumptuous cuisine... what more do you want me to do, draw you a map? Read this thing."